The world of Ingo is once again brought to life in Helen Dunmore's newest spellbinding sequel "The Tide Knot." "There's a current racing ahead, the colour of the darkest blue velvet. We plunge forward. The current is so strong that it crushes me. I'm jolting, juddering, struggling in its grip, but I can't break away. It's got me, like a cat with a bird in its claws." Sapphy, Conor and their mum have moved away from the cottage by the cove - away from the memories of their father, who disappeared two years ago - to the nearby town of St Pirans. Ever since, Sapphy has felt withdrawn and restless; she can't adjust to her new home and new life, and can't suppress the memories of her father and his mysterious disappearance. Unhappy in the world of Air, Sapphy finds herself increasingly drawn to the underwater world of Ingo and to her Mer friend, Faro. There she makes new friends: Faro's powerful, wise teacher, Saldowr, the dolphins, a whale and even sharks. But Ingo is becoming a more dangerous place. Although Conor senses this and pleads with Sapphy to stay away from Ingo, he cannot get through to her. And as Ingo grows in power both Sapphy and Conor are called to its depths to take on the might of Ingo's tides! 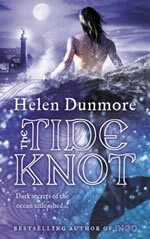 The Tide Knot is the second book in the Ingo series, and it was published in hardback in May 2006. The paperback of the first book, Ingo, was published at the same time.